St Kentigern (or Mungo) is better known for his foundation which grew into the modern sprawl of Glasgow. To part the mists of ancient history the reader must turn to an ancient "life" of Kentigern written around 1180 by Jocelin, a monk of Furness Abbey in what is now north-west England. Jocelin was obviously using a Celtic text of much greater antiquity as the foundation for his life. In the ancient annals he is named CONTHIGERNI (meaning "hound-lord") which in later Welsh could give Cyn-deyrn, whence the modern Kentigern has come presumably through an intermediate Gaelic form Ceanntigearn "chief lord"). St Kentigern is said to have departed from his original foundation on the shores of the Clyde because he feared for his own safety. He is said to have taken flight to Wales but there are many indicators that he took a considerable amount of time over his journey and founded a number of churches along his route through Cumbria. This was not a panic-struck exodus! "King Rederch, seeing that the Christian religion was entirely destroyed in his kingdom, set himself zealously to restore it. And after long considering the matter in his own mind, and taking advice with other Christians who were in his confidence, he discovered no more helthful plan by which he could bring it to a successful result, than to send messengers to St Kentigern to recall him to his first see." Kentigern was somewhat reluctant to return from his foundation at Llanelwy in North Wales, the place now known as St Asaph's but, eventually, he was persuaded but his return journey was punctuated by many "hesitations" as is shown by the significant number of churches he founded as he travelled north. Kentigern brought with him a number of his followers from Wales, some of whom, as we shall see, accompanied him later as he carried the Christian torch into north-east Alba. It was after he had returned to Glasgow, circa 574, and after he had taken the immediately necessary steps to reorganise the Church in Strathclyde, that Kentigern continued the task of continuing the ministry which that Church had initiated amongst the Picts. Two of those who accompanied Kentigern on his return to Strathclyde were St Nidan and St Finan. In Anglesey the reader will find Llanfinan and Llanidan (the churches of Finan and Nidan) very close to each other and an old Welsh pedigree suggests that Nidan was Kentigern's cousin. It is obvious that these two also accompanied Kentigern on his journey to the Pictish tribes of the province of Mar and their legacy is seen in the foundations bearing their names. Kinnoir, to the north of Huntly, was of old described as "the Annat of Kynõr", annat being the ancient name for the mother church of a district. Amongst the native titles of St Kentigern few are older than "Apostol Kynor", the Apostle of Kynõr. St Kentigern's master, teacher and friend, Servanus (St Serf), had been at work in this district many years before, and his foundation of Culsalmond is about eight miles from Kynõr. Nearby can be found, to this day, a hill known as "the Hill of Mungo", and the farm nearby is still known as "Annatswell". What we see here then is the foundation of a Brtonic-Cymric church during the later part of the sixth century. To the local Picts, Mungo and his followers would have been welcomed in their midst since they, as Britons, spoke a tongue which was very similar to the native language and certainly could be easily understood by them. How long Kentigern spent amongst our ancient predecessors is unknown although it must have been for an appreciable length of time in order that the annat at Kinnoir could have had time to establish itself. It is more than possible that Finnan and Nidan remained behind to continue their master's work. There is no doubt that their inheritance was the establishment of a brave and sophisticated culture amongst the Christian Picts. These Christian foundations provided an education to the children and gave them a rudimentary introduction to song and poetry and a passionate love of nature. They also brought the tribal craftsmen into contact with the wider Celtic traditions and skills which then allowed them to produce the stone masterpieces to be seen at Migvie, Loch Kinnord and elsewhere. These Pictish peoples were far from the barbarians that some would have us believe. There is no recorded evidence of a Christian missionary being murdered by a Pict which can not be said for many other tribes who inhabited our islands at the time. They have left us with a fabulously rich inheritance in all aspects other than the written word. Would that these early missionaries had allowed the secret skills of the scriptorium to be more widely learnt. 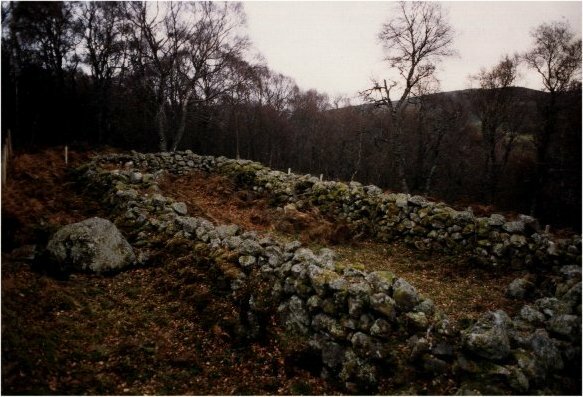 The picture above shows the remains of Kentigern's church hidden deep in a birch forest in Glengairn. One of his biographers made him 185 years old when he died! It may be that he packed 185 years of any ordinary person's living into his life, but most suggest that he was in fact 85 years of age. The great Kentigern at last achieved his rest and passed from this life sometime between 612 - 614 AD, his obit being remembered for eternity on 13 January.